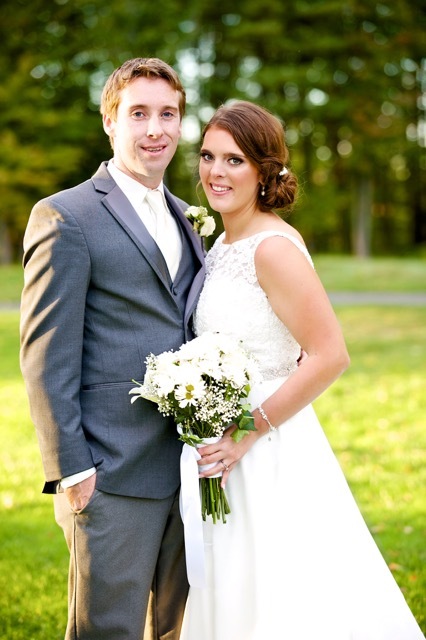 Margaret Emily Griswold and Kieran Patrick Farrell were united in marriage on October 1, 2015, surrounded by family and friends from around the world. Margaret (Meg) is the daughter of Curtis and Sheree Griswold of Fulton. Kieran is the son of Michael and Marion Farrell of County Cork Ireland. Father John Cannoro officiated the Catholic Mass and Sacrament of Holy Matrimony at Holy Trinity Church in Fulton. Meg’s maid of honor was Angel Hutchins of Schenectady. Her bridesmaids were Emily Kinnear of Washington State, Marie Farrell of Dublin, Ireland and Amanda Hawley of Washington DC. Kieran’s best men were Padraig Quille of Listowel, Ireland, and Edward Stack of Kerry, Ireland. Groomsmen were Adrian Farrell of Glasgow, Scotland, and Kieran O’Carroll of Kerry, Ireland. Ushers for the guests were Brandon Harris, Gregory Griswold, Zachary Griswold, brothers of the bride and Michael John Farrell, brother of the groom. Usher for the mother of the bride was Dackoda Harris, nephew of the bride. Readings were read by Gregory Griswold, Zachary Griswold and Michael John Farrell. The prayers of the faithful were read by Sheree Griswold and Michael Farrell, mother of the bride and father of the groom, respectfully. The gifts were brought to the altar by Mykayla Harris , Alexis Heiman and Dackoda Harris, nieces and nephew of the bride. Flower girls were the bride’s nieces, Kallyssa and Kasiana Harris and Juliet Griswold. A glamorous evening of dinner and dancing was enjoyed by all at The Shenandoah Clubhouse at the Turning Stone Resort in Verona. Meg and Kieran honeymooned in Key West and now are residing in Rochestown, County Cork Ireland.